What makes this salad Sicilian, you might ask? Well reader, I haven’t the slightest. But it’s good! It’s real good. This is my attempt to copy my favorite dish (of the same name) from Mandola’s, a pretty good Italian place up in the Triangle. While we’re on the subject- I say this place is ‘pretty good’ because I’ve had both lovely dishes (this salad, spaghetti carbonara, cookies!) and lackluster ones (a very blah caprese panino, so-so marinated vegetables on an affettati plate). Anyway, in my days before The Lumpy Dumpster was on the scene, my friend Erin and I used to eat here all the time for work lunches, and we would both always order this salad. It just has everything going for it-sweet tomatoes, briny olives, rich olive oil-soaked bread, and salty cheese. Come on! That’s tasty. 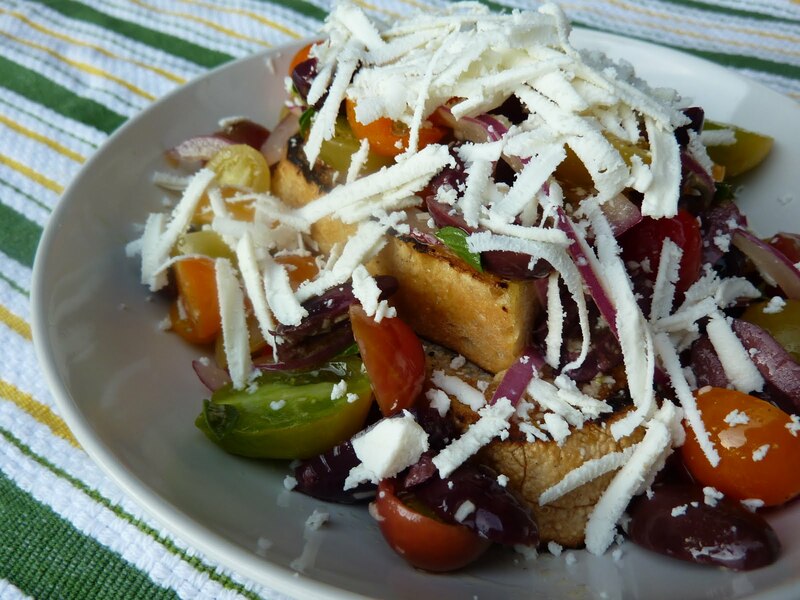 To recreate this dish, I used a basket of beautiful cherry tomatoes from the farmer’s market, added wafer-thin slices of red onion, oregano from my garden, and a handful of kalamata olives. For the vinaigrette, I decided to add a couple tablespoons of finely grated pecorino cheese (which I looked up, and actually is Sicilian! (it’s fun to learn because knowledge is power!)) to a simple red wine vinaigrette, and the results were really enchanting. Every bit of the salad is flecked with a nutty aged cheese! The grilled bread in the bottom is a very basic bruschetta, which I learned how to make from David Rosengarten’s cookbook, Taste. That’s the fun thing about making a restaurant dish at home- at Mandola’s you only get that one delicious, tomato juice-soaked piece of bread at the bottom of the bowl. At home, Andy and I each got three slices. And let me tell you friend, we ate the hell out of them. Fire up your charcoal grill or preheat a gas one. 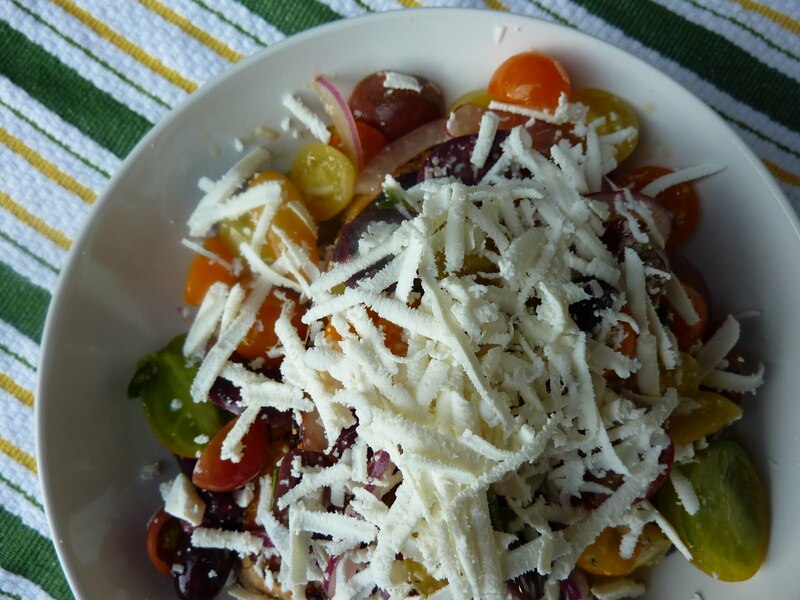 Combine the cherry tomatoes, red onion, kalamata olives, and oregano in a medium bowl. In a small bowl, whisk together the red wine vinegar, the grated pecorino, and a pinch of kosher salt and pepper. Slowly drizzle in the 3 tablespoons of olive oil and whisk until emulsified. Pour over the tomato mixture and toss to coat. Grill the slices of bread a minute or so on each side until handsomely charred. Rub the slices of bread with a smashed garlic clove, and drizzle both sides with olive oil. Season with kosher salt and freshly ground black pepper. To assemble, place a slice of grilled bread in the bottom of two bowls. Spoon the tomato mixture on top of the bread slices and finish with the grated ricotta salata. Serve with extra bruschette! I see that you're one of the Food 52 winners featured in the new cookbook. I'm working on a story for the Chicago Tribune about this, and I'd love to talk with you. I'm on deadline for early next week (9/27), so would you mind shooting me an email at contactjenniferday@gmail.com so we can set up a time to talk by phone? Thanks!